An interview with Karen Cator, director of education technology, and John White, deputy assistant secretary for rural outreach for the U.S. Department of Education. Too often, reviews of edtech fall short of reality. Sure, speeds and feeds are important to consider, but how does this stuff work in the real world? 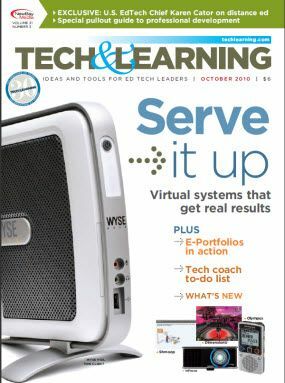 T&L will try to answer that question this school year when our editors follow the stakeholders at Village Charter School (VCS) in Trenton, NJ as they implement Pearson’s SuccessMaker software on a 40-seat Dell PC desktop network. This month— Meet the teachers: Professional development for faculty. Desktop-based virtualization lets schools manage many enduser machines from one desktop. The technology’s use in school is nascent, but these schools have already taken the first steps. Read what they have to say. • Are those earbuds really causing damage? When the Lincoln (NE) Public School District implemented electronic portfolios two years ago, the lightbulb was turned on for educators everywhere. T&L Blogger Kim Cofino shares her priorities for starting the year off right.